With the week over, it's revealed that the upcoming Marvel movie has sold twice as many advance tickets as Aquaman, Star Wars: The Last Jedi, Avengers: Infinity War and Captain Marvel combined. The part of the teaser we're most interested in comes at the beginning - a line of dialogue in which Captain America says to the surviving Avengers: "You know your teams". But there are some new scenes in this TV spot. No mistakes, no do-overs. Applaudience has more even more exciting info. Avengers: Endgame sold more tickets in pre-sales than Captain Marvel did on its opening day on Friday (874k+ tickets already sold). "This is the fight of our lives". It is the first time we see the team wearing matching outfits, showing a sign of unity that the team hasn't previously displayed. Rocket Raccoon (Bradley Cooper) then sums it up best when he tells Ant-Man (Paul Rudd), "He's pretty good at that". Unfortunately, it looks like the Hulk is missing from this group scene - quite possibly as a misdirection so we aren't suspicious of Bruce Banner appearing as the Hulk in this film. Avengers: Infinity War made $2 billion, Aquaman made $1.147 billion, Star Wars: The Last Jedi made $1.332 billion, and Captain Marvel now has $1.041 billion. It's unknown which teams Captain Marvel and Thor end up with, at least at this moment. Take those two, add in the three heroes yet to be seen in Endgame footage (Okoye, Valkyrie, and Wong), and combine it with the nine heroes seen in the new clip, and that brings the count up to 14 again. 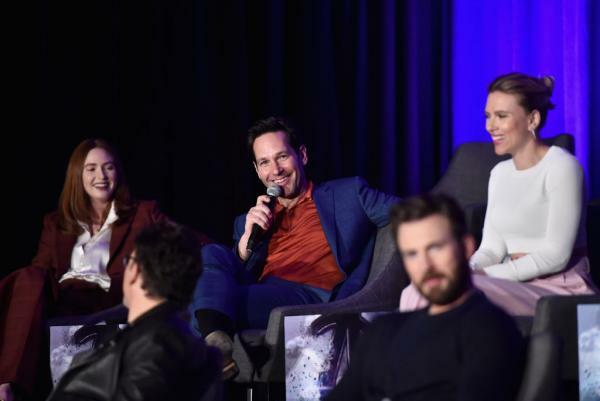 Featuring Robert Downey Jr, Chris Evans, Chris Hemsworth, Scarlett Johansson among others, Avengers: Endgame hits the screens on April 26.